Apple and LG Display are allegedly finalizing talks on an OLED supply deal, which could see the latter provide panels for a rumored 6.5-inch iPhone, which is believed to be a jumbo-sized version of the iPhone X.
LG is likely to ship a relatively small number of panels —15 to 16 million —in the second half of the year, according to Korea Herald sources. 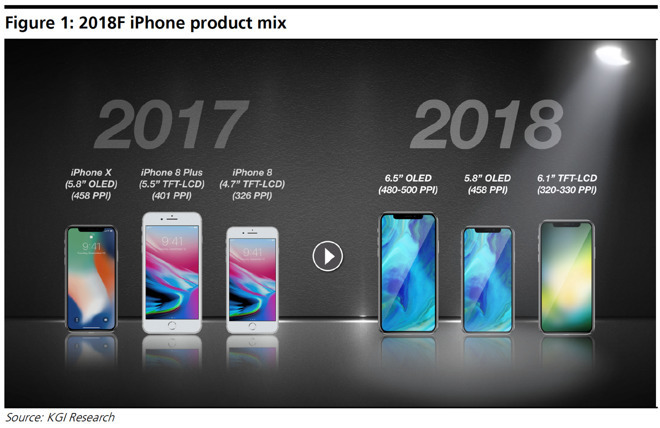 That contrasts sharply with iPhone X panel supplier Samsung Display, which is thought to be churning out nearly 10 million units per month. A deal was foreshadowed in December when LG submitted a regulatory filing in response to local media claims. "Regarding the OLED supply deal for Apple's iPhone X, nothing has been set in detail," the company wrote. "When anything is confirmed in detail, we will announce it, or [otherwise an announcement will be made] in a month." That could mean a public statement will be made within days, though it's unlikely LG will say exactly which device it's providing parts for. In fact suppliers rarely even acknowledge Apple as a client, presumably because of enforced secrecy. Earlier this year, Apple is said to have pumped $2.7 billion into LG as an advance payment for OLED panels. At the time it was thought that the order was for panels shipping in 2019, but it could be that the terms have evolved. Apple is expected to ship two OLED iPhones in 2018, including a 5.8-inch model and one measuring 6.2 to 6.5 inches. A 6.1-inch LCD iPhone could meanwhile give people an affordable alternative.